Portland was the 151st stop for the Freedom Train, which toured the country from 1947 through 1949, visiting every state and over 300 towns. A traveling museum guarded by U.S. Marines, documents traveling and displayed on the train included original copies of the Declaration of Independence, the Bill of Rights, the Northwest Ordinance, the 1873 Treaty of Paris, the U.S. Constitution, the Emancipation Proclamation, the Gettysburg Address, and the Tokyo Surrender. In President Harry S. Truman’s words the Freedom Train was intended to be a broad national educational program seeking to emphasize the blessings of our American heritage [i.e. a propaganda campaign]. Portlanders found that out Thursday as they shuffled in endless queues, for from five to six hours before boarding the gleaming vehicle – but they took it without a whimper. It was their heritage they came to see, and tired feet were a small price to pay. 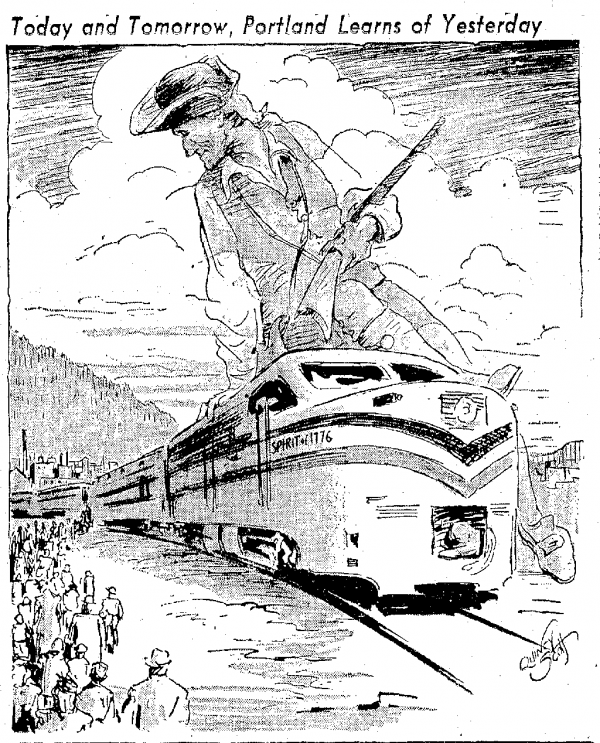 As a Portland-related sidenote, Reed College president Dr. Peter Odegard originated the idea for the Freedom Train in 1942 while he was an assistant to Secretary of the Treasury Henry Morgenthau (The Oregonian, 26-September-1947). He proposed it as a combination war bond selling campaign and educational project. During the war the plan had been approved, even up to consulting with the British government to obtain the Magna Carta for the tour. But shortage of materials during the war, security concerns, and the fact that movie stars and entertainment at that time looked to some officials a better bet for selling war bonds nixed those plans.